Construct masonry structures with brick and block specializing in fireplace and arches with the use of hand tools, power tools and other masonry materials while maintaining a safe and clean environment. Discover how to manage construction projects by applying skills such as blueprint reading and estimating labor and materials while working in a team environment to achieve success. Install floor and wall tile, repair and restore old or damaged masonry work and lay hardscape pavers using a variety of masonry materials. Learn about and use different types of mortars and know the application for each. Use power equipment safely and efficiently to complete masonry projects. 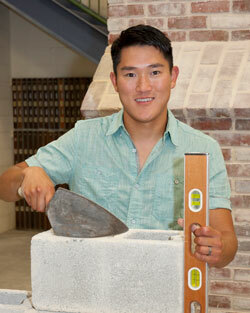 I began working in the masonry field during summer break when I was in middle school and continued until college. 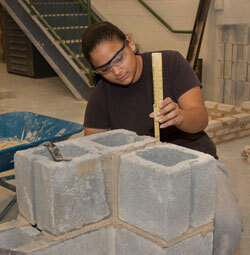 I have always enjoyed working with my hands and I chose to go to college for construction technology. I graduated from Lehigh Carbon Community College in 2011 with an associate’s degree in Construction Technology. 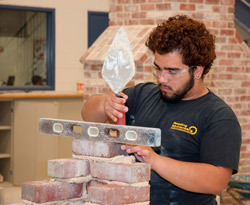 I have worked for several different companies and worked in the career and technology education field as an instructional assistant in the masonry program at another career and technology school. Most recently I worked for a commercial masonry company called The Witmer Group. I reside in Lancaster with my wife and dog. I enjoy the outdoors and staying active. My hobbies include hunting, fishing, camping, exercise, tae kwon do, and hap kido. I have been a part of various work and mission trips with my church. This includes helping the Opportunity House in Reading and the Water Street Mission in Lancaster. I have helped with my church youth group for many years. I have also helped with SKILLS USA.